Aunt Ruth would always make more of this than she needed and pack individual servings in micowavable containers. We'd freeze them till we were hungry, then pop them in the microwave. They came out perfect every time. I've made this recipe myself and it came out delicious. Blend the egg and oil together to create a batter. Dip the chicken in the batter. Then in the seasoned bread crumbs. Coat both sides with crumbs. Place the breaded chicken on a cookie sheet coated with non-stick spray. Bake it for 8-10 minutes at 450 until golden and crisp. Do not turn it over. Combine the chicken broth, pepper, salt, tomato paste, garlic, and oregano. Thicken this sauce over medium heat. 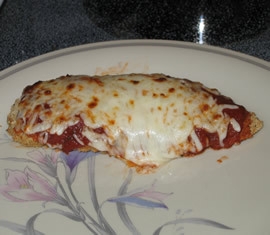 Spoon the sauce over the cooked chicken cutlets and top them off with cheese. Broil till the cheese bubbles. Eat them up or freeze them for later. This recipe can also be used with veal or boneless turkey.